What day is it? HUMP DAY! Sorry, I know that commercial is so 2013, but I can’t help myself. I am kicking off a new beauty series today all about my makeup essentials. I will break it up into different parts, including face, eyes, lips and beauty tools. You can look for each series installment every Wednesday as I work through each category. Today, I begin with part one of face products. If you’ve been reading MITM for a while or have just recently become acclimated with the site, it is easy to figure out that I have very sensitive, acne-prone skin. Out of all the makeup categories, I probably have tried and tested face products more than any other makeup. Although my self-proclaimed beauty junkie status drives me to continue to test new and different products, these face essentials are what I consider holy grail products in my collection. I wear each on a daily basis, either individually or all together depending on how much coverage I am looking for, and I never have had an issue with breakouts, creasing or foundation rub-off on clothing. I also used all the products on my wedding day, which I consider to be the ultimate makeup test, and without fail, my face still looked as perfect at the end of the night as it did at the beginning of the day. If you’re struggling with picking out face makeup for your collection or are in the market to try something new, I cannot recommend these items enough! 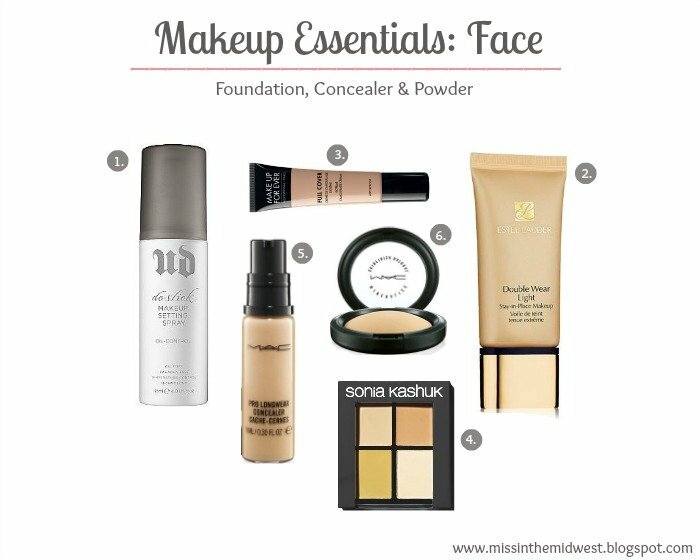 Tell me: what are your essential face makeup products? You have a great makeup routine here. Great post. I really don't think you'll be disappointed with these products! This horrible Midwest winter has wreaked havoc on my skin, but this makeup has still made my face look great even if I'm having a "bad face" day. On some days, I even just use the MUFE or Sonia Kashuk concealer to cover blemishes and the MAC powder all over for an even coverage, and my skin agrees with that well, too. Let me know how you like the products if you give them a try. Good luck! Thanks for reading. The UD setting spray has replaced a traditional primer for me, so I strongly believe it extends the wear of my makeup. I spray this a few times prior to applying my foundation, again after I am done applying my foundation/concealer before I apply my powder, and then at the very end of my makeup routine. I typically don't even get shiny or oily until after 8 or 9 hours of wear. As I mentioned, I used this on my wedding day, and my makeup still looked flawless at midnight that night as it did at 10 a.m. that morning when I applied it. There are three different types of the UD setting spray (I've also used the all nighter spray), so just make sure you get the one that suites your needs and skin type. Hope this helps – thanks for reading! So i've heard a lot of good things about the UD setting spray!! It's on your must have list – how do you feel the wear is on it? Like does your makeup actually stay longer than 8 hours? So I am definitely going to look into some of these products– it sounds like I have the same skin type and I've had an awful time finding winter face products that work for my skin.